The Harvey Girls (1945), a musical set in a 19th century Fred Harvey Restaurant with Angela Lansbury and Judy Garland as stars, and with an Oscar-winning song: "Atcheson, Topeka and the Santa Fe"
Hollywood enjoyed its greatest financial year in history in 1946. An all-time peak in annual box-office receipts, at $4.5 billion, was achieved. The best of Broadway revues was remembered in Ziegfeld Follies (1946), with William Powell reprising his role as the great Broadway impresario. Cameos and appearances by many stars, such as Judy Garland, Fred Astaire, Red Skelton and Lucille Ball, populated the film. Arthur Freed was the driving force behind MGM studios and the growth of the musical genre in the 40s and 50s. Gene Kelly made his official screen debut as a song-and-dance man in director Busby Berkeley's (and producer Freed's) hit musical For Me and My Gal (1942), opposite Judy Garland (her first film with her name billed alone above the title in the credits). The all-black musical Cabin in the Sky (1943) and the nostalgic, charming turn-of-the century Meet Me in St. Louis (1944) (with its immortal standards "Have Yourself a Merry Little Christmas", "The Boy Next Door" and "The Trolley Song" by Judy Garland) were both produced by Arthur Freed and directed by former Broadway director Vincente Minnelli (lured by Freed to MGM in 1940), who would soon marry his star in 1945 and produce one daughter - Liza Minnelli. Freed and Minnelli were responsible for giving birth to the total musical film experience and big-budget studio musicals. Freed's successes continued with Rouben Mamoulian's Summer Holiday (1947), Minnelli's The Pirate (1948), Busby Berkeley's Take Me Out To The Ball Game (1949), and Stanley Donen's/Gene Kelly's On The Town (1949) - filmed mostly on location in New York City. Entertainer Al Jolson and bandleader Paul Whitehead starred as themselves in Rhapsody in Blue (1945), the life story of American composer George Gershwin (played by Robert Alda - Alan Alda's father), noted for writing An American in Paris. The musical biography Night and Day (1946) was the life account of songwriter Cole Porter (Cary Grant), and featured Mary Martin singing "My Heart Belongs to Daddy." Cornel Wilde starred as the Polish composer Frederick Chopin in Columbia Pictures' hit musical biopic A Song to Remember (1945), with Merle Oberon as George Sand and Stephen Bekass as Franz Liszt. The hugely-successful The Jolson Story (1946) was an energetic film biography of one of America's most popular vaudeville entertainers of the 1920s, known for singing: "Mammy! ", "California, Here I Come," and "Swanee". The film was followed by a sequel: Jolson Sings Again (1949) with Larry Parks again in the lead role. Fred Astaire danced for his second and final time with Rita Hayworth in Columbia's You Were Never Lovelier (1942). The famed dancer also starred with Judy Garland in Easter Parade (1948) featuring Irving Berlin songs (such as "(We're) A Couple of Swells"). And then Astaire and Ginger Rogers appeared in their tenth and final film together, MGM's The Barkleys of Broadway (1949). The hit Broadway comedy The Man Who Came to Dinner (1942) was adapted for the screen and directed by William Keighley for Warners - it starred Bette Davis, Ann Sheridan, and Monty Woolley (as the unwelcome title character Sheridan Whiteside). Claude Rains starred in Universal's Technicolor musical remake of the original horror film The Phantom of the Opera (1943) as the title character violinist Enrique Claudin, forced to wear a mask to cover his disfigurement, and madly in love with opera singer Christine (Susanna Foster). Betty Grable's legs were prominently displayed in the musical Mother Wore Tights (1947), a turn-of-the-century story about a vaudeville family, starring Dan Dailey. The biggest hit film of 1944 was the heart-warming, Oscar-winning musical comedy Going My Way (1944), starring Bing Crosby and Barry Fitzgerald as conflicting members of the Roman Catholic clergy. [The film was first screened on 65 different military bases on April 27, 1944, as a way to support the war effort.] Its equally-popular sequel released the following year, The Bells of St. Mary's (1945), starred Bing Crosby and Ingrid Bergman. Life With Father (1947) was a screen version of the hit Broadway play of a turn-of-the-century New York family. Danny Kaye starred as the title character - a hapless daydreamer who imagines himself in heroic adventures, in the fantasy musical comedy The Secret Life of Walter Mitty (1947) - known for the sound of his imaginary life-saving machine ("ta-pocketa, pocketa"). Judy Garland was at the height of her talents in MGM's In the Good Old Summertime (1949), a musical remake of The Shop Around the Corner (1940), about two anonymous pen pals. 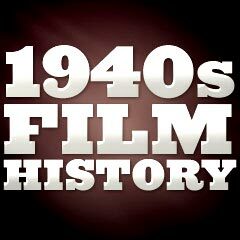 From 1940-1946, soundies (short black and white musical films) were produced. They were pre-cursors to present-day music videos, and were designed to be played on coin-operated, 16 mm rear-projection machines like jukeboxes, called Panorams, that were located in nightclubs, diners, roadhouses, bars, restaurants and other public places. 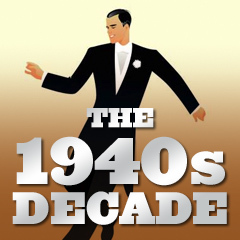 Besides musical numbers representing many different musical styles (swing, big band, jazz, blues, country and western, hillbilly, Gospel, Latin American, Hawaiian, dance, musical comedy, and more), soundies would often include cheesecake sequences of women in bathing suits, vaudeville acts, or strip-tease/burlesque routines. Because they were produced during the war years, they also featured war bonds appeals and other patriotic jargons. Hitchcock also made some superb psychological thrillers: the favorite of all of his films was Shadow of a Doubt (1943) about a psychopathic 'Merry Widow' killer named Charlie (Joseph Cotten) in a small California town. Hitchcock's psychoanalytic, post-war mystery Spellbound (1945) (produced by David O. Selznick) contained Dali's surrealistic dream sequence and featured psychiatrist Gregory Peck suffering from amnesia. The spy thriller Notorious (1946) was a dark foreboding story of an espionage scheme to trap a Nazi agent. These films reflected post-war acceptance of a darker style of film-making. It wasn't until Rope (1948) that Hitchcock switched to color, in an experimentally-ambitious film seamlessly put together with ten-minute extended takes. Lean's melodramatic tear-jerker Brief Encounter (1946), heightened by Rachmaninoff's piano concerto, told a story of unfulfilled romance between a married middle-class woman (Celia Johnson) and a doctor (Trevor Howard) - at a railway station tearoom. British director Carol Reed filmed an adaptation of Graham Greene's script - for the classic, post-WWII noirish suspense thriller The Third Man (1949) set in a divided Vienna and starring American actors Joseph Cotten and Orson Welles (as black marketeer Harry Lime). Reed's earlier crime drama and tense character study Odd Man Out (1947), set in Belfast, starred James Mason as an IRA gunman wounded in a robbery gone awry. French director Jean Cocteau directed the classic live-action, love drama La Belle et La Bete (Beauty and the Beast) (1946) - a remarkable, visually surrealistic, and unique re-telling of the fairy tale. And Marcel Carne's post-war romantic drama masterpiece Les Enfants Du Paradis (1945), a bittersweet tale set in 19th century Parisian theatre and secretly filmed during the Nazi occupation, was acclaimed for its lyrical beauty and doomed passion. The most popular British film star comic of the late 1930s and early 1940s (of the pre-TV era from the mid-30s to the mid-40s) was George Formby, noted for playing a ukulele, morale-boosting during the war years, singing songs with double-entendres, and repeating the catchphrase: "Turned out nice again." His notable films included Keep Your Seats Please (1936), Keep Fit (1937), and It's In the Air (1938). Another of the most favorite British comedians was Will Hay. In films from Ealing Studios, his most famous character was an incompetent school master with a pince-nez, often playing opposite toothless Moore Marriott and fat Graham Moffatt. The last film Will Hay co-directed was My Learned Friend (1943) before his death at the end of the decade. British film comedy reached its creative zenith in the 40s with productions made by the short-lived Ealing Studios. One of Ealing's most whimsical political satires in the late 1940s was Passport to Pimlico (1949), starring Margaret Rutherford and Stanley Holloway in a tale about a district in South London that was determined to belong to Burgundy, France. Another British black comedy from Britain's Ealing Studios, Kind Hearts and Coronets (1949) featured Alec Guinness in eight roles in the film, and was considered the best comedy of its year. Director Alexander Mackendrick's Ealing release of Whiskey Galore! (1949) (aka Tight Little Island) was also well-revered. The independent studio would become well-known for its late 40s and early 50s comedies, such as The Lavender Hill Mob (1951), The Man in the White Suit (1951), and The Ladykillers (1955). Laurence Olivier adapted, produced/directed (his first and most successful effort), and starred as the title character in one of the greatest Shakespearean adaptations ever made: Henry V (1944) - the tale of Britain's victory over the French at Agincourt (and famous for the line: "Once more unto the breach, dear friends, once more"). During England's besieged condition against the Nazis, the Technicolor epic was dedicated to the fighting forces and stiff resolve of Britons. He masterfully merged the set of the Globe Theatre with on-location set-pieces. The film wasn't released in the US until 1946, when Olivier received a special Honorary Academy Award for "his outstanding achievement as actor, producer and director in bringing Henry V to the screen." After the war ended, another Olivier adaptation Hamlet (1948) was awarded Best Picture and Olivier won the Best Actor Oscar. British actress Deborah Kerr's first Hollywood success was in her debut US film The Hucksters (1947). Later, their psycho-voyeuristic horror-thriller film Peeping Tom (1960) was controversial for its twisted view of a homicidal, psychopathic photographer. Roberto Rossellini's influential, documentary-like landmark film Open City (1945) formally introduced Italian Neo-realism - it was the first film in a Rossellini 'war trilogy' of post-war Neo-realistic films. It was a gritty and realistic post-war film set in the underworld of war-time resistance, with the use of on-location cinematography, grainy low-grade black-and-white film stock and untrained actors in improvised scenes. The first indication of Neo-realism came with Luchino Visconti's Ossessione (1943) two years earlier. Italian director Vittorio De Sica filmed the neo-realistic classic The Bicycle Thief (1948) on location in post-war ravaged Rome - the humanistic, anguished father-son story of an impoverished bill-poster and his young son (both non-actors) in search of his stolen bicycle. Other representative Neo-realism examples included: Rossellini's Paisan (1946), De Sica's Shoeshine (1946), Rossellini's Germany, Year Zero (1947), Visconti's La Terra Trema (1948), Rossellini's Stromboli (1949), and De Sica's Umberto D (1952). Italian Neo-Realism, portrayed by film-makers Rossellini, Luchino Visconti and Vittorio De Sica, lasted until 1952.